I’ll start by saying MEG is short of megladon, as is megladon sharks, sort of dinosaur sharks. I thought I’d take a break from my romance extravaganza to try something a little different. 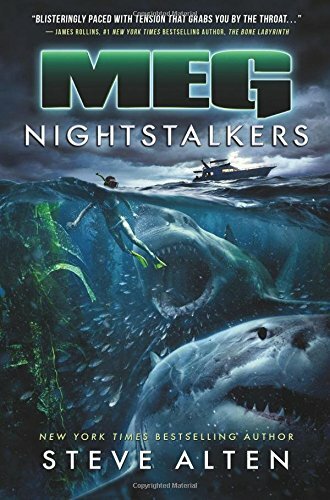 Nightstalkers is I think the 6th book in the MEG series and is an adventure story about scary prehistoric marine life roaming our oceans. Not my normal fare but a good read none the less. It being late in the series I did have a little catching up, but I give Mr. Alten high marks for making the 6th book in a series also a very good stand alone novel. Having written a 5 book series myself, I know that’s a really hard feat to accomplish. That’s not to say there weren’t a few issues. Holy Guacamole, Batman, there were a lot of characters in this book! You need a program to keep track of them all, and that’s my suggestion. I’ve read books that have had one or two sentence bios of the main characters at the beginning of a book. I’d have been super happy to have had one of those for this book, especially for some of the dead characters eaten in previous books. Most novels I read don’t have illustrations. This one did. It had maps, which were very helpful as the ships were sailing all over: from Alaska, to Australia, to Antarctica. There were also a few illustrations of the creatures. Yeah … I could have used a couple more of those. There’s only so much you can describe of a fanciful sea creature before what I’m picturing in my head looks nothing like what the author intended. It ain’t just sharks, we’re talking prehistoric whales and alligators too. I will admit, the story lost me a bit when time travel got involved. Quite frankly that little side story flopped for me. All they say is that’s how the one guy knew what was going to happen, that he’d gone back in time a few months and was reliving them. The book never says how that happened and why it didn’t happen again so I’d have written it out of the novel if I were the author. Thankfully, that bit only lasted a few pages, any more and I’d have stopped reading. This is a great read. I finished it in two days, not that it was all that long. It was unpredictable, funny and boy, did I cry! Yes, it’s a tear jerker, but in a good way. It paced well and had a fabulous ending. Honestly, my only complaint was that the male protagonist dropped the F bomb a few too many times for my taste. Yes, it was probably in keeping with his character, but still, it’s not in keeping with me as a reader. I highly recommend this book. So much so that I’ve already started book 2 in the series. Yes, the sequel dropped by a star. The protagonists in this story were very good, but not as compelling as in the first book. Plus a few things sort of annoyed me with this book. Rebecca, the female lead in this book was a side character in book one. It was said that the male protagonist in book one was a little scared of her because she beat him up as a child. He still seemed intimidated by her which seemed odd to me since she mostly drank wine, shopped and did her nails in book one. Low and behold… in book two we find out that she used to me a cage fighter along with the male lead in Book one! Well, had I known that in book one, that would have made a lot more sense. 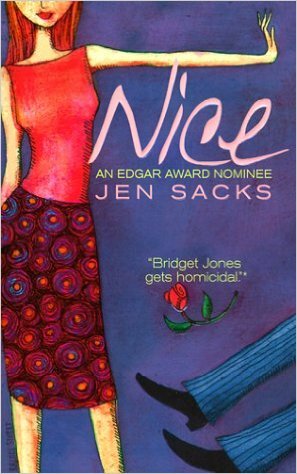 In this book, Rebecca has two friends that are party girls, always going to clubs. It isn’t until the end of the book that you find out the friends used to be cage fighters as well. I think these were my main complaints about these books, that vital bits of info were neglected and tossed in a little too late for my taste. This is a very funny book in a satire sort of way. Basically it’s a love story between a professional killer and your joe average woman who ends up killing her dates when she doesn’t have the heart to tell them she’s just not that into them, thus hurting their feelings. The story itself is a five-star story that I highly recommend. There were a couple of issues that kept it from that five-star overall rating. First would be the use of words you have to look up in the dictionary, like vituperously, somnambulistic and ablutions. I’m all for writing stories that make the reader stretch their mind, but come on. Who did she think was going to read this book? This was a really short read, but still a good story. Had Miss Mondello added an epilogue, I probably would have given in 4 stars. As it is, the story ends awkwardly, leaving me to wonder if they live happily ever after … or happy for now??? To me, romance is all about the ending. I get that this was a shorter novella that she put out for free to attract readers, but she does herself a disservice with this ending. I’ve read other books of hers that were better. I’ll start by saying I’m a big fan of this series, but the first 6 or 7 books in the series were definitely the best. Once they started branching out to the family in Colorado, I think the series started to lose me. I was really confused when I started reading this book. I thought I’d read it before. So much so that I was just about to put it down when I realized that the author had put out a Christmas short story that was the beginning of this book. Once I figured that out, the story was good. Nothing special. Maybe I’m being a bit unfair seeing as the first books in the series were all 5 star wonders. Since I bought this as a boxed set, I’ll review it as one book, not the three books it touts itself to be. If I was to review them individually, they’d all get 2 stars each. To be honest, book 1 was pretty good, but left you with a cliffhanger. Book 2 was a complete departure from the love story of book 1. I’m not even sure if I’d classify Books 2 or 3 as romance. They’re more action, suspense that romance. Personally I’m always disappointed when a writer has to bring in a Mexican Drug Cartel to spice things up. To write that Kinsley could join a drug and smuggling cartel with any believability strains any sense of realism. I know most romance novels are escapist literature, but please … I think the author wrote herself into a corner in this story. I get the distinct feeling that she was writing without an outline and once she’d gotten Kinsley involved with the cartel, had no idea how to resolve the story. Most of Book 2 and 3 was her incessant interior monologue wondering if they believed her or not. For some reason she seemed to think the FBI had jurisdiction in Cancun Mexico and Paris France, because the author had them storming the Cartels facilities in both places. Not terribly realistic. This one gets 4 stars by the skin of its teeth. Honestly, if I wasn’t on a three star streak, it would probably get 3. What’s holding it back? WORDS! This book has wonderful characters and a good story line, but it is plagued with way too much extra prose. I found myself skipping pages upon pages of just too much detail and unnecessary information. It really is a shame as an edited version of this book would rate a good five stars. Basically the gist of this story is that Caroline, a 30-year-old military wife in a bad marriage, falls for Sebastian, the 17-year-old son of another military family. Yep, they’re breaking the law. The whole book builds up to the last couple of pages when the author answers the question, will they get caught or not. I thought the last pages were a bit of a let down as it just leads you into book 2, that is if you want to find out that happens to them. Yep, sucker that I am, I’m reading the sequel right now (but only because it was free with kindle unlimited!) From the way book two is shaping up, I’d say if both books were combined and edited, they’d make a great single novel. Still, if you don’t mind skipping pages, The Education of Sebastian is a really good read.